I like that our partner organization, SIL, has created something necessary for so many people around the world. With technology often favoring well known languages it leaves millions of people at a loss when they want to use the computer. We love languages! God created them all! Being able to type a language is important for Bible Translation. So proud that this is now available. Give it a try here if you can use it for your own work! Picture this. A rugged mountainous South East Asian country. This country is not open to the religion of Christianity. But through the work of Wycliffe Associates and their colleagues, the Open Bible Stories (OBS) have been translated into the national language. The Open Bible Stories are 51 stories from the Bible that cover that basics from Genesis until Revelation. Beautiful pictures accompany each story and the Good News is clearly communicated. These are a great resource for opening the door to translating a Bible in various languages. Ken has been a part of the workshops that support these translations. The 2,500 Christians in this region are hungry for God’s words in their own language so the pastors in the T language are excited to use this resource. Although the community is uneducated with approximately 80% unable to read or write, they long to learn more about their Savior. The local pastor also plans on distributing 1,000 OBS to the various villages in the area to reach an unchurched and unengaged group. The pastor says that there is a lot of false teaching as well as sheep stealing in this region. A picture Bible will be perfect for them! Will you pray right now for the T people? More Papua New Guinea Photos! Mobilized Assistance Supporting Translation is an innovative method of Bible Translation. Motivated by the local church, translators, pastors and lay people gather together and can draft large portions of Scripture in a short amount of time. Watch the short video above and it will explain the process in a clear way. God’s Word in the mother tongue brings joy to the heart to those that have received it. Unfortunately, many still lack God’s Word in their mother tongue and have been waiting for too long. This Bible translation method is generating excitement and joy and hopes to reduce and even eliminate that wait! Ken departs next Tuesday to help support another workshop teaching this method. He’ll be in Papua New Guinea for several weeks working with a large group of people. They will be translating 51 Bible Stories into Tok Pidgin so that they can be uploaded to an open web site. This site will make the Truth of God’s Word available in a new way to a larger audience. Thank you for being a part of this wonderful process. ****As of today, two colleagues that are supposed to accompany Ken on this trip still have not received their visas! We need a miracle to get them there! Please pray for Ken July 28-August 18. (Orlando, Florida, USA)—Wycliffe Associates, through their Scriptures for New Frontiers initiative, is supporting local Bible translators living in the Middle East and Central Asia, where there is a widespread, deadly presence of extremists. Over the past year, 11 of the 28 Bible translators living and working in this region have been reported dead or missing. “While we mourn those who were lost, we are committed to continue their work, supporting national translation teams in this part of the world,” says Bruce Smith, President and CEO of Wycliffe Associates. In this region, nearly 1,000 languages—representing 280 million people—are without the Scriptures. Bible translators need technology, training, and resources to translate the Bible as quickly and effectively as possible. Extremist groups are free to operate and are systematically wiping out Christian minorities. Some Christians have been abducted and interrogated in an attempt to force them to renounce their faith, while others have been beaten, jailed, and put to death. Translations of the books of Genesis, Luke, and Acts have already been completed by some and are ready for production and distribution. The Scriptures for New Frontiers initiative provides open-source Bible translation technology, training to support national-led translation efforts, digital Scripture distribution, and resources to empower local underground translators. Wycliffe Associates is currently raising $300,000 to equip these local translators with the technology and training they need to work more safely. Of the 6,901 languages spoken worldwide, only 531 have a full translation of the Bible. A Bible translation is currently in progress for 2,195 languages, and 1,023 languages in the world have at least one book of the Bible. Wycliffe Associates is striving to achieve the goal of beginning the translation of God’s Word into every remaining language by 2025. Because millions of people around the world still wait to read the Scriptures in the language of their heart, Wycliffe Associates is working as quickly as it can to see every verse of God’s Word translated into every tongue to speak to every heart. Last year, 2,544 Wycliffe Associates team members worked to speed Bible translations in 73 countries. ***This post was copied in its entirety with permission from wycliffeassociates.org. Today is Bible Translation Day! This story and photo comes directly from http://www.wycliffe.org. Did you know there’s a day set apart worldwide to honor the work of Bible translation? Well there is, and we’re excited to tell you about it! In 1966, Wycliffe founder Cameron Townsend first shared an idea with Oklahoma Senator Fred Harris, his friend of several years. Harris liked the idea and agreed to propose the resolution in the Senate. Soon Cam received word that the resolution passed! On September 30, 1966, a ceremony was held to proclaim that day as Bible Translation Day. Since the Apache New Testament had only recently been completed, Cam decided they should present that translation as part of the ceremony. 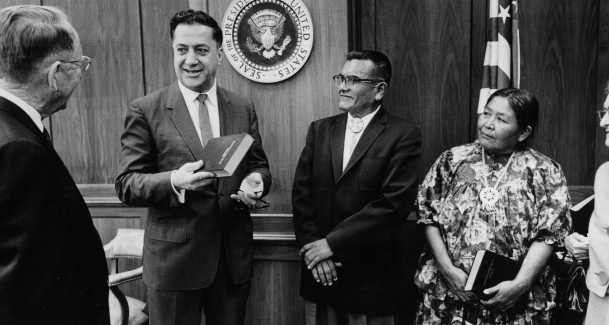 Senator Harris presided, and Cam arranged for Britton Goode, the Apache who had helped the translators, to present the Scriptures to him and Congressman Ben Reifel. A Sioux Indian from South Dakota, Reifel had witnessed firsthand the impact that owning the Bible in her heart language had on his mother, who spoke only broken English and used the Sioux Bible to teach her children about God. Several people gave speeches that day, including both Senator Harris and Congressman Reifel. Cam’s speech was, as always, one that left the group in attendance encouraged and inspired. “We are making history. By God’s grace and with His help, we are taking part in a tremendous enterprise,” said Cam, as he began his speech. “The enterprise is Bible translation; the goal is hearts changed by God and disciples equipped to lead others to Christ. But before any translation can be done, before any change comes in a heart, we must overcome physical and language barriers. In the years since Cam first started Wycliffe, 518 language groups have received the entire Bible and 1,275 have the New Testament in the language they understand best. Additionally, over 1,500 Bible translation projects are currently in process. Today, Wycliffe continues to carry on the tradition of celebrating Bible Translation Day. With unwavering focus towards the unfinished task at hand, Wycliffe seeks to pursue the goal that Cam so eloquently laid out in his speech — that of bringing the translated Word of God into every language that still needs it. Can you imagine having to drive to a town miles away every time you needed to send an email? It’s hard to imagine with the wonderful technology choices we have here in the USA. Our computers, tablets and mobile phones can immediately send and receive our emails mostly 24/7. In fact, if you live in a “dead spot” where Internet connectivity is spotty or the local fast food restaurant doesn’t provide free Wi-Fi, we can get a little crabby. 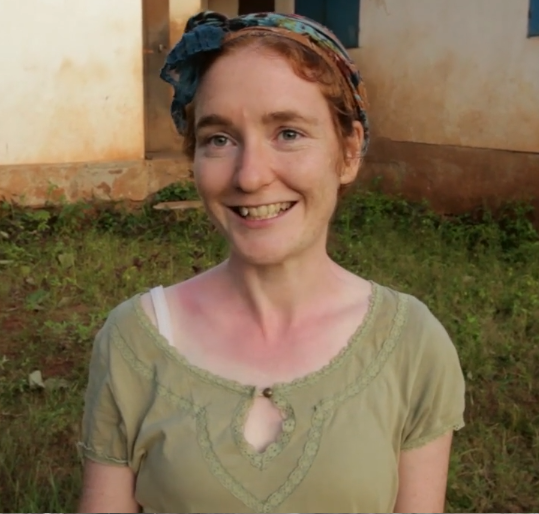 Kathleen Spence is a linguist who works in Central Africa Republic (CAR). She works with the Bhogoto Language Project. Bhogoto…you’ve heard of it, right? Maybe you studied it in school when your friends were taking Spanish or German courses, no? Of course not. But for the 200,000 speakers of this language, it’s important to them! While French is spoken in many places across CAR, most people cannot understand it hardly at all. So having a Bible in French just doesn’t do the job for them. It’s about as helpful as you or I having only a Bhogoto Bible to read. Click here to watch a very short video on some of the challenges that face translators in this region. I’m so excited that we are part of a group that provided them with Broadband Global Area Network (BGAN) as well as a solar set up to help since there is no electricity in the region. Oh, yeah, there’s that too. No electricity. Boy, do I have an easy life. Thanks for praying for us and projects like this.